3. The boys had "Sprinkle Cakes" for breakfast. They were SO happy and giggly and making a mess while eating them. For those of you less descriptive folk, you probably call them Pop Tarts. 4. Two of our most favorite friends are coming over for dinner. We will spoil them with good food and play cards and laugh until we pee our pants. Not really. But close. 5. Jason's Friday summer work hours. He comes home at one o'clock. Praise Jesus! 6. A pantry full of groceries. Even if the bank account is significantly depleted as a result. 7. Max's cheeks. Jack's humor. 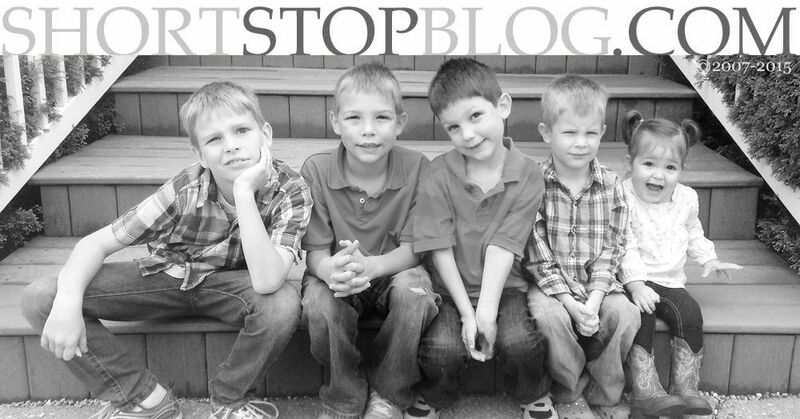 They're big stars on this blog, but even bigger ones in my life. 8. I'm making Mom's Chocolate Chip Cookies. Here's a pic in case you don't click over for the recipe. Now, don't you wanna go make 'em? Do it. You'll never be the same. Bring on the weekend! Have a great one! I will agree - those are the bestest cookies!!! Have a wonderful weekend and a great time with your friends tonight! Sounds like a great day. Hope you have fun tonight! I was wondering what sprinkle cakes were - great name! Sounds like a wonderful weekend is in store for you. Now I have to check out those cookies! love the term "sprinkle cakes" - love it! have fun with your good friends tonight - sounds like a wonderful way to spend a Friday night. 1 thing I love about yesterday? I made your dessert you posted. It was divine! looks like a perfect start to a great summer weekend! enjoy! So I was planning to bake my favorite choc chip cookies today, but you have enticed me to try yours instead! Actually going to go bake some now. :-) Thanks girlie! Pajamas all day- gasp! I'm glad I'm not the only one that doesn't make it out of jammies- especially on a rainy day like today! Glad your hubby gets off early- what a blessing!!!!! I'm so sorry, I forgot to post my address for you to send those cookies out to me. I know you were wondering how to get them to me. If you are really stuck for a way I am willing to meet you halfway...LOL. ooops, hit that button a few too many times....lol! Guess I REALLY miss it! Just had to let you know that I made your cookies this weekend and THEY WERE A HUGE HIT! I've been trying to find a cookie recipe that suits both husby and me. He likes crispy and I like chewy. Anyways, thanks for sharing! Hope you had a nice weekend. Knowing my weakness for chocolate chip cookies, I am definitely trying these the next time we make cookies!